Two stories hit my whisker radars today. One is about a Big Fat cat (and I thought I was hefty at 15 pounds. Dr. Clark, the Cobble Cove vet wants me to stop having the snacks Donald, the new librarian keeps passing me. He took up where Mac left off). This juicy morsel of news involves a good Bud of mine, Grumpy Cat and my favorite Broadway show, CATS. I wish I could audition for a part. Maybe Debbie can write me in for a cameo appearance in the play in her third Cobble Cove mystery. I missed my opportunity in the sequel. Even though she has scenes in New York City, I am not featured in them. Meow and Hello. Welcome to my blog. For those who don’t know me, I’m Sneaky the Siamese library cat from the Cobble Cove Mysteries written by Debbie De Louise. I was introduced in my first adventure, A STONE’S THROW, in which I helped Alicia Fairmont discover a very important clue in the library’s storage room. My next starring role will be in BETWEEN A ROCK AND A HARD PLACE, that will be hitting the virtual shelves this month. I will share some of my exciting excerpts with you in a future blog post. Also, since Debbie is a member of the Cat Writer’s Association, she has recruited me to share important news from the cat world on topics of interest to both felines and their humans. As a library cat, I am quite knowledgeable. I also learned quite a bit from John McKinney, Alicia’s love interest in A STONE’S THROW. John is the newspaper publisher of the Cobble Cove Courier. One of my regular features will be interviews with fellow feline characters. I have already shared a list of questions with Debbie to email to cat authors on my behalf and, likewise, I’m sure those authors will transcribe their kitty’s replies. 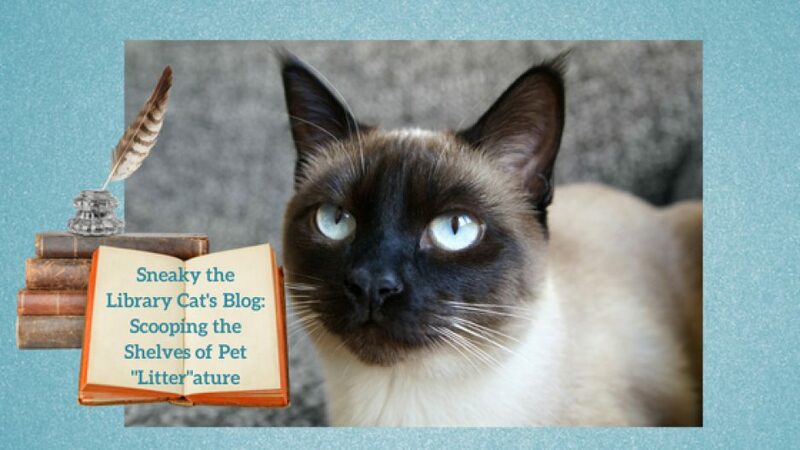 If your cat character would like to be featured on my blog, please contact Debbie. Occasionally, I will also invite surprise guests such as Debbie’s own cats, Oliver and Stripey, as well as a dog or two. I hope you enjoy this blog and my posts.